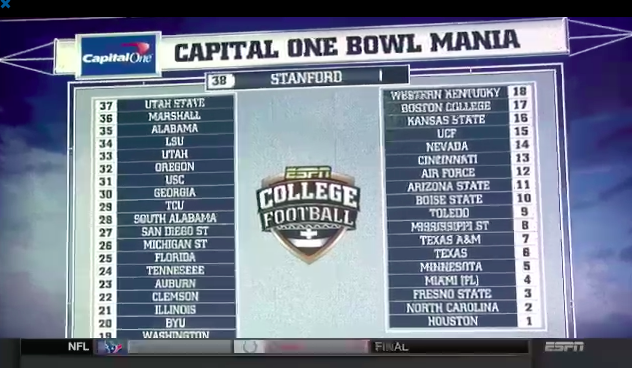 It is once again that time of year for COLE’S BIG BOWL BOARD! We will be updating this post all throughout bowl season with more picks, predictions, confidence points and projections that we come across, so check back often to see who picked against your team. Note: The number after the pick is the confidence point they have chosen for their pick if they have one. I will post when and where they made the picks since people change their minds as we get closer to the actual games. I present to you picks in no particular order. Enjoy. With the close of the 2014 regular season yesterday, as noted by the completion of the Army/Navy game, it is time to get geared up for bowl season. I thought I would post a quick regular season standings post so we can all see where everyone stands for the year. Bowl season can change everything, just like that professor you had that one semester who said the final exam counted for half of your grade. With 38 bowl games coming up, that is like cramming 3 average weeks of picks for most of our pickers, so it can make or break a season for anyone bold enough to pick all 38 games and share them with their adoring public. 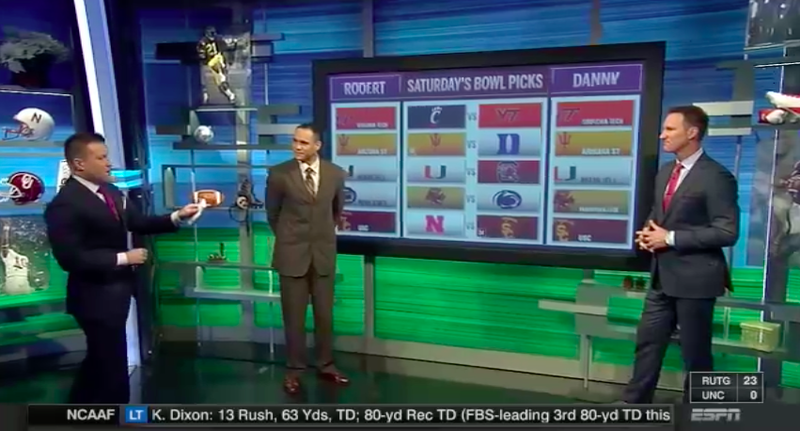 We will be posting GAMEDAY COLE’S BIG BOWL BOARD of any and all picks we find for anyone preparing your bowl pick’em entry and those of you who need to bag on Kirk Herbstreit some more (which judging by Twitter is a LOT of you). Anyways, here’s the rankings. More stuff will come out soon. 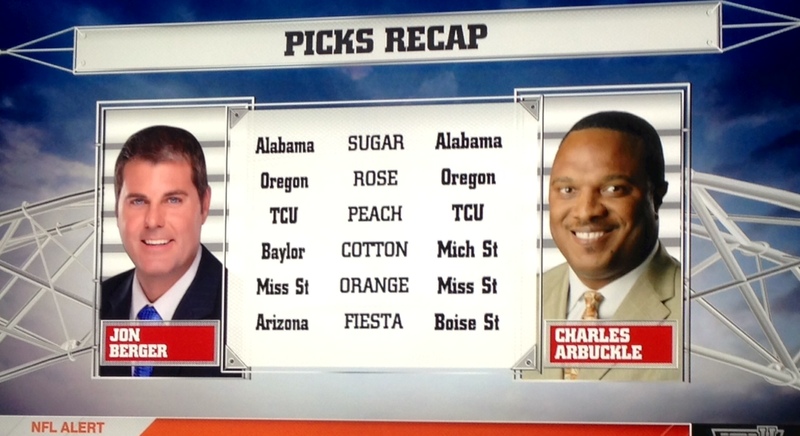 Our tiny, tiny week of football games brought us only a slight dusting of picks, but picks are picks in my book. Winners this week were Lee Corso (3-0), Desmond Howard (3-0), and Jennifer taking this week’s championship showing her knowledge of obscure games going 4-0 this week. Losers this week were Kirk Herbstreit, who continues to slide down the rankings this year, and special guest picker Roger Staubach, who both went 1-2 on the week. Chris Fowler also took a one game loss picking Army over Navy. That’s it. 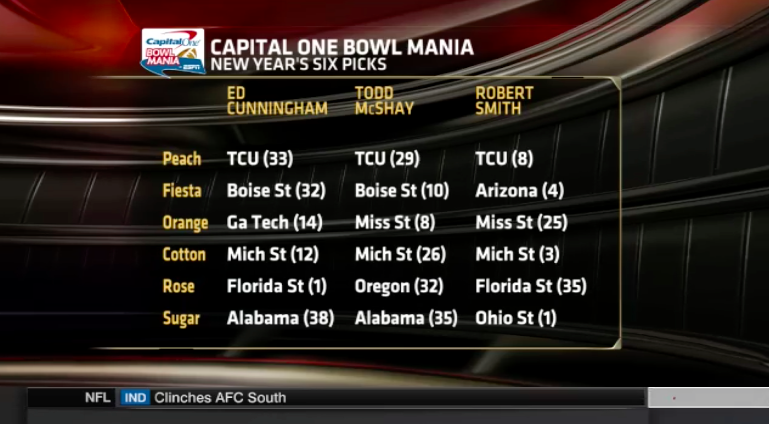 We are prepping for the postseason and bowl mania, so there will be tons of new picks coming at you soon!